Our talented chefs have taken Emmental, Cheddar, Gouda and Camembert to create the ultimate cheese sauce. Supremely versatile, it can serve as a tempting topping on pasta bake, spread thickly between layers of lasagna or smothered over cauliflower. 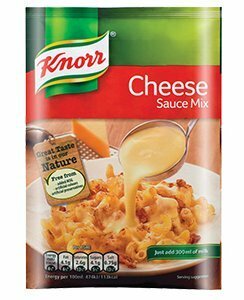 This package contains 5 x Knorr Cheese Sauce Mix 33g packets. If you have any questions about this product by Knorr, contact us by completing and submitting the form below. If you are looking for a specif part number, please include it with your message.